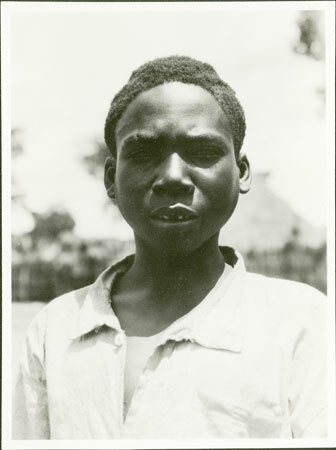 A portrait of a boy (identified as Biso) with a notch in the front teeth. This filing of the teeth was done for display purposes and was known as masua. In C.G. & B. Seligman's Pagan Tribes of the Nilotic Sudan (London, Routledge 1932, page 518) they note that '[t]he teeth are not removed but a v-shaped notch is cut between the centre pair of upper incisors.' This information is based on Larken, "An Account of the Azande", Sudan Notes & Records, 1926. In The Azande (OUP 1971, page 114) E. E. Evans-Pritchard notes that 'I was told that first the incisors were sharpened (zagbali or lindi ango), then this gave way to mande, the boring of a hole pointed towards the gums between the central upper incisors, still occasionally seen during my residence in Zandeland. This in turn gave way to masua, a notch like an inverted V cut between the same teeth, as commonly seen at that time. These mutiliations were done ni ngbanya 'for ornamentation'. Morton, Chris. "Portrait of a Zande boy" Southern Sudan Project (in development). 03 Jan. 2006. Pitt Rivers Museum. <http://southernsudan.prm.ox.ac.uk/details/1998.341.107.2/>.